Marlon CS Longlife installed as roof lights or vertical sidelights, provides natural daylight into farm buildings and sheds. Naturally day lit buildings not only create a pleasant and improved environment for livestock but also have significantly lower running costs and are more energy efficient than those buildings relying on artificial light sources. PVC Panels are ideal for use as a wall or ceiling liner panel in any type of confinement building (hog, dairy, poultry). The product is easily power washed and will never rust, since it’s solid PVC. PVC’s chemical resistance allows for regular cleaning and sanitary maintenance, as well as extended service in harsh chemical environments. Panels are easy to install and maintain using standard tools, while still preserving their glossy appearance over long periods of time. 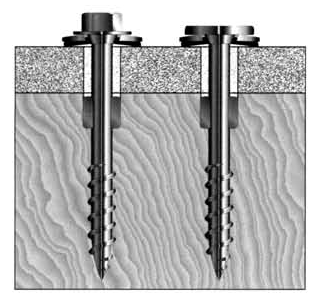 With a revolutionary design, these fasteners self-drill expansion holes and automatically centers the screw. The sealing washer allows installed panels to float in a single step operation.